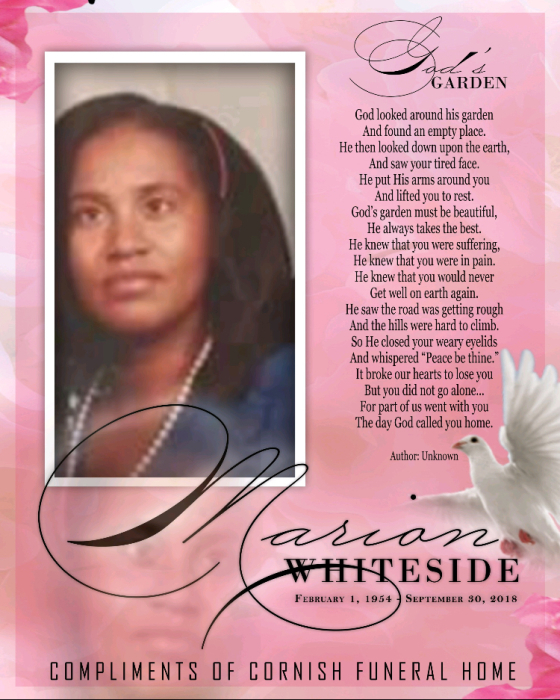 Marion “MJ” Whiteside peacefully departed this life on September 30, 2018, while being a patient at Riverside Regional Medical Center. She was born February 11, 1954 in Isle of Wight County. She received her education at the Westside High School. Marion worked various jobs throughout her life, from Smithfield Packing Plant to the Daily Press, Sam’s Club, and more. No matter where she was her love of the Lord was heard by all that would listen. As a young girl she had dreams of being a preacher. Those dreams would turn into reality, as she grew up to later preach at various churches. When she wasn’t spreading the Word of God, she was delighting the ears of many through singing. Marion was a wonderful mother to her children. She took pride in raising them in the Lord. She also was a “Nana” to six of “Nana babies,” whom she loved dearly. She was predeceased by her mother, Margaret Wynn; father, Baxter Bradby; and her son, Joseph Wyatt. She leaves behind her husband, William Whiteside, along with her beloved family which includes: her two sons, Michael Judkins of Norfolk, Virginia and Jason Wyatt of Newport News, Virginia; two daughters, Erica Wyatt of Tennessee and Charity McCarthy of Newport News, Virginia; Melvin Wynn of Richmond, Virginia, Larry Wynn of Smithfield, Virginia, and Roy Wynn of Surry, Virginia; three sisters, Catherine Williams of New Jersey, Francis Elkerson of New Jersey, and Missouri Tillery of Smithfield, Virginia; six grandchildren; a host of nieces, nephews, and other relatives, and friends. The family of Marion Whiteside would like to extend our sincere appreciation to all who aided and comforted us during this time of bereavement. To be absent from the body is to be present Christ. Millions didn’t make it, but she was one of the ones who did. Funeral Services: Saturday October 6th, 2018 at 1:00 p.m. at Calvary Community Baptist Church Newport News, Virginia.